Abby DuBow received her BA from Bennington College and her MA from the Bank Street School of Education. 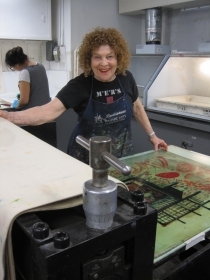 She has been a working artist her entire life and an art educator who taught at the Lenox, Fieldston, Brooklyn Friends, and Columbia Grammar and Prep Schools for over 30 years. She has continued to pursue her own art education at such diverse venues as Atelier 17 in Paris, the Art Students League, the Brooklyn Museum, Parsons School of Design, Great River Arts Institute, Zea Mays, Manhattan Graphics Center, and the Contemporary Art Center. She has studied painting, drawing, and printmaking with a variety of instructors including Stanley William Hayter, Paul Feeley, Tony Smith, Edith Katz, Rueben Tam, Seong Moy, Joe Stapleton, John Hultberg, Janis Loeb, Catherine Farish, and Sarah Amos. Her work has been exhibited in galleries throughout the country and is in many private collections. She has received many awards for creativity and excellence.